Nephure Reviews: Does it Really Work? This is the long-awaited independent review for Nephure oxalate reducing enzyme! So, in this Nephure review, we’ll begin with answering the question – what is Nephure Oxalate Reducing Enzyme? Quick answer: it is an innovative food supplement designed to help neutralize oxalates in foods. Thereby reducing their sizes significantly – hence lowering the overall oxalate level in a portion of food. If you are under a kidney health program this supplement can be helpful as it gives its users more freedom in food choices. You can add Nephure enzyme to your favorite to a range of foods to neutralize the oxalate content in them. The manufacturer of this oxalate reducing enzyme claim users no longer need to worry about eating certain foods or beverages that are oxalate-rich. As claimed, the formula has the ability to significantly reduce and neutralize oxalic acid levels in their favorite foods. Who is the Manufacturer of Nephure Oxalate Reducing Enzyme? The company making this enzyme is called Nephure. They have a detailed website where they also share lots of information related to foods and oxalates. They share recipes and diet ideas that may help users with making low oxalate menus. On their website, Nephure says their product is made in the USA, using domestic and international ingredients. They also say the product follows AUA guideline and is manufactured inside FDA approved clinic. How Does Nephure Oxalate Reducing Enzyme Work? This product uses a straightforward yet simple approach to deal with both already consumed and in-food oxalic acid. It contains an active enzyme by the name oxalate decarboxylase. So in action, this enzyme splits oxalate compounds. Important to mention is, oxalic acid naturally occurs in the body and in most foods. In precise oxalate, decarboxylase enzyme reacts to bind oxalate and split it to smaller weaker pieces. As such, this significantly reduces the amount of oxalate in a person’s body as well as the target food. Nephure Oxalate Reducing Enzyme Ingredients – Are they Safe & Effective? Most enzyme-based supplements have been seen to deliver their promise. In this case, Nephure oxalate neutralizing enzyme capitalizes on the enzyme oxalate decarboxylase which is considered safe inside the human body. The greater percentage of users seem happy with the product so far – proven by reviews and comments about this product on retailer websites. More about safety, the manufacture of this enzyme says it’s been clinically proven to be non-GMO as well as gluten-free. It’s said to produce zero side effects and non-habit forming. Blue-green algae – claimed to be the main source of the enzyme used in the product. Oxalate decarboxylase – also the main ingredient in the supplement associated with splitting down oxalate into tinier compounds. Preservatives – to help keep the formula usable and in good shape for extended period of time. What are the Advantages of Nephure Oxalate Reducing Enzyme? Might help reduce oxalate content in foods that are considered oxalate-rich – such as spinach. It works instantly, reducing oxalate in foods on consumption. The cost is way cheap compared to the benefits it delivers. What are the Disadvantages of Nephure Oxalate Reducing Enzyme? It is not meant to treat, but to reduce oxalate amount in foods. The manufacturer has made available limited information regarding Nephure’s ingredients. Users have to work had to find this information. Some people may find the product too good to be true, but it works. 1 Q. How is Nephure Oxalate Reducing Enzyme Used? Asn. The product is designed into rations of smaller portions called stick-packs. According to the manufacturer, one stick is to be added into the beverage that accompanies your meal. In precise, this will be twice a day together with your two heaviest meals. Due to the size, users who want to ensure reduction of oxalates even at work can stash the stick-packs into their handbag or pocket. 2 Q. How Much Does Nephure Oxalate Reducing Enzyme Cost 30 pack? “Ans. Currently, the oxalate enzyme goes at around $25 per pack. However, users who order more than a single pack get a discount. 3 Q. Where to buy Nephure oxalate neutralizing agent? Aspiring buyers can get it on retailer websites at around $24 for bulk orders, which is a bit cheaper. 4 Q. What is Nephure Oxalate Reducing Enzyme’s Return Policy? Ans. The manufacturer of this oxalate reducing powder allows 30-day money back guarantee that users who feel unsatisfied with the product can return it and have their money refunded in full. 5 Q. 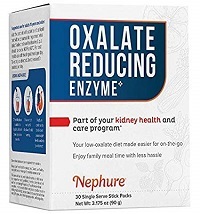 Does Nephure Oxalate Reducing Enzyme Offer Free Trials for their Product? Ans. For the trial version, the manufacturer is not clear enough as to whether they do promote the product with free trials. Maybe this can be arranged for aspiring users by getting in touch with the makers. 6 Q. Does Nephure Oxalate Reducing Enzyme Work? Ans. Most users claim this enzyme is working well and effectively for them. Nonetheless, the reducing-power-time-span may vary from food to food. Nephure oxalate reducing enzyme may help users enjoy back some of their earlier secluded foods due to low oxalate dieting. In precise over 90% of customers seem satisfied with the product so far. However, it’s obvious that users who give reviews are often less in number than the actual number of users. So far, there are no many of such like food supplements that claim to reduce oxalate in foods. What we have in the market are capsules that promise to break down already formed kidney stones. Do these kidney breaking supplements work, their manufactures point out that they do assist to keep a healthy kidney program. However, seems like this product might take over the place of kidney stone breaker supplements because it is taking the approach of avoiding oxalate absorption, which is what causes kidney stone formation, right up front. Nonetheless, to reach there the makers need to do more in terms of publicizing the product so as to bring it closer to people who might find it helpful.